Most outside analysis of China’s parade was surprisingly sensationalized, superficial, and over-interpreted. Even though any regime will have multiple purposes when conducting a major event, there will always be a main reason motivating them for doing so. The organizers will also have main target audience in mind for such a display. People should try to avoid overlooking the main reason instead of focusing on the secondary objectives. The parade was conducted on the morning of September 3 for only three hours; however, it was a general mobilization for the entire PLA. In fact, each branch of the military, the PLA, PLA Navy, PLA Air Force, and the Second Artillery Corps, all participated in the parade. When people make comments on this parade, they should not forget about what has transpired within the PLA in recent years. Through Xi Jinping’s anti-corruption campaign the PLA experienced its largest personnel change since the Cultural Revolution. Guo Boxiong and Xu Caihou, the two chief commanders of the PLA just three years ago, were both indicted on corruption charges, and more than 50 PLA generals were removed from their positions under the party’s investigations. This is a huge shakeup of activity within the military power structure, and it has had a huge impact on the PLA—both within its own ranks and in the eyes of the people. For China’s top leaders, the military parade served the important purposes of reenergizing the PLA’s morale and helping to improve both its image with the people and solidarity within its ranks. Therefore, the parade itself was a major simulation and mobilization for the PLA after its significant power restructuring. A very special aspect of the parade was the inclusion of 56 PLA generals actively participating in the parade themselves, marching with their soldiers and taking part in all training exercises in the months leading up to the parade. This was the first time in the history of the PLA’s military parades that such an action was taken, as generals from all branches of the military marched with the troops. It was a power exercise to reemphasize the Party’s absolute control of the PLA. Any interpretation suggesting that the parade was used to mainly serve Beijing’s foreign policy, or to display power to China’s neighbors, overlooks the main reason the parade was held. Another reason for the misinterpretation is that people often use their own culture and historic framework to understand another country. For a nation like the United States that does not hold military processions, it is a little difficult to understand Beijing’s actions, so it’s tempting to assume that there must be some special meaning. Many of the comments about the parade have somehow automatically assumed Beijing is just using the 70th anniversary of the war’s end for the purpose of propaganda. For many Americans, 70 years is so long ago and not relevant to current politics. However in terms of historic memory, China’s memory is too long, where the United States’ memory is too short. It should also not be forgotten that WWII was a terrible and violent war that took place in China’s homeland. During the war the Japanese occupied over 900 Chinese cities, and China suffered 14 years of foreign invasion and the brutality of war. It is true that the government has used this part of history as a tool and resource for mobilization. Yet this is no doubt the darkest period of time in the history of China and many Chinese families have sad stories about the war that pass through the generations. In fact, during recent weeks one of the most popular trends on Chinese social media has been people posting family stories and photos about the war and their experiences. To simply consider the anniversary of the war as government propaganda is inaccurate. That is also the reason this parade was so enthusiastically supported by many Chinese, and many were angry about the foreign reports and Western media accounts regarding the event. 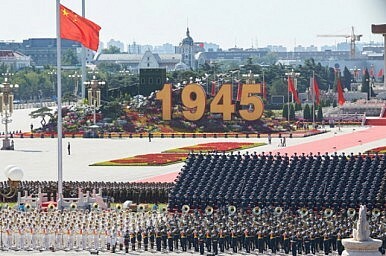 The military parade of September 3 mainly served domestic purposes, though the international media inferred it was an extension of foreign policy. It may be that this was a public relations failure for Beijing, judging from the response it elicited from the outside world, and there are important lessons that Beijing can learn from this. China is rising as major world power, so there is no doubt that any actions or remarks from Beijing will closely be watched and interpreted. It is also natural that such a major event and eye-catching military procession would draw so much attention, but people outside China should be aware that over-interpretation is irresponsible, risky, and even dangerous, as it often leads to misunderstanding and misjudgment. Zheng Wang is currently a Carnegie Fellow at New America. He is the Director of the Center for Peace and Conflict Studies and an Associate Professor in the School of Diplomacy and International Relations at Seton Hall University in New Jersey. His book Never Forget National Humiliation: Historical Memory in Chinese Politics and Foreign Relations is the recipient of the International Studies Association’s the Yale H. Ferguson Award.